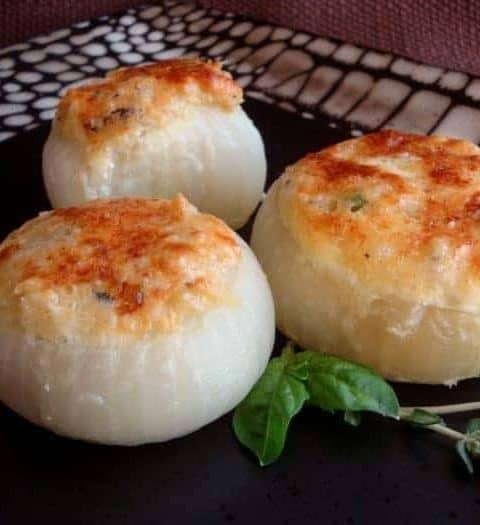 Stuffed onions is an impressive side dish and a perfect compliment to any main dish. Brunch or dinner. Even a substantial option for your vegetarian guests. This dish can be made several hours ahead or even the night before and then pop them in the oven to cook after the meat is out and resting. 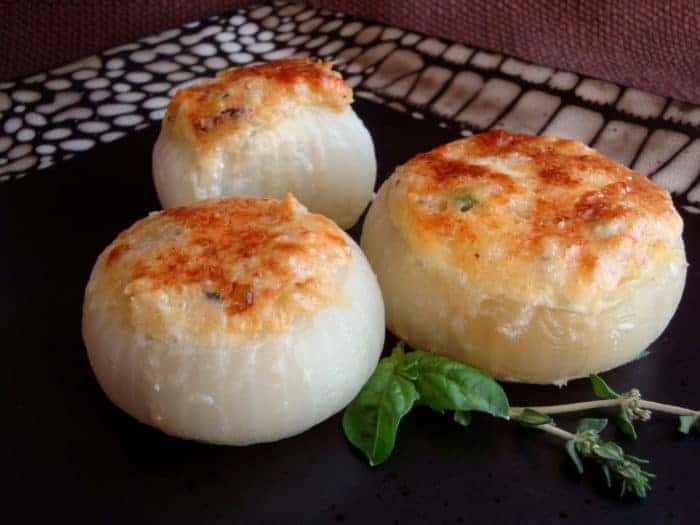 Select your mix of herbs for the stuffed onions to fit your menu. I combined basil, thyme and flat-leaf parsley just because that is what I had on-hand. That combination would pretty much go with anything, but if you’re having poultry, try sage, thyme or rosemary. With lamb, basil and thyme. Any mix will compliment your ham but maybe add more of the cheese. Be sure to use good quality cheese and fresh herbs for that spring-is-here flavor. 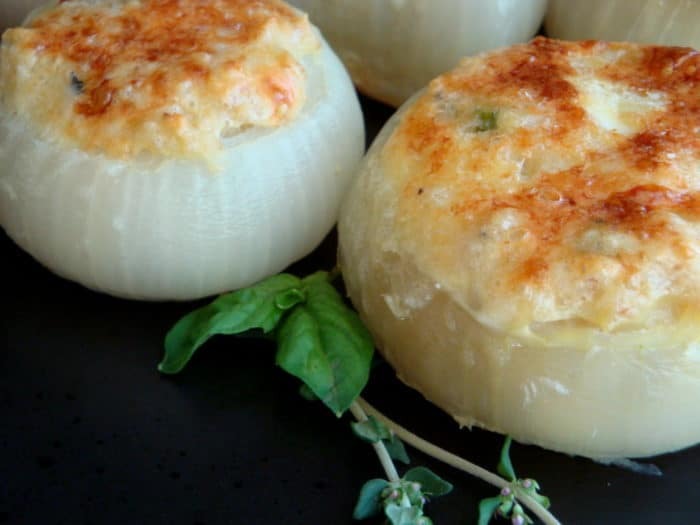 Here is a stuffed onion cut and almost gobbled up! The raisins add a really nice, surprising sweetness that I promise you will love. Use relatively flat onions for this dish, if possible. Many Walla Wallas come this way as well as Borretta white summer onions. Bring a pot of water to a boil, and boil the onions until tender, about 13 minutes. Drain well and let cool slightly. Cut the top and bottom of onions off horizontally. Chop the onion insides and place into a bowl. You should have just one or two outer rings of each onion intact. Add the chopped herbs and mix well. 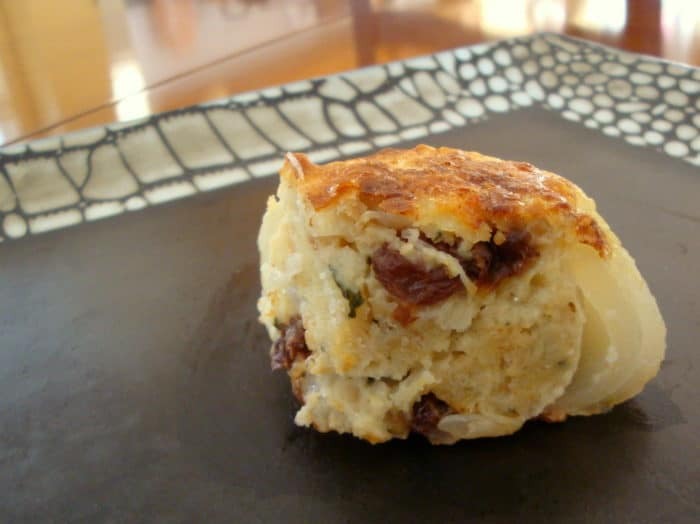 Soak the breadcrumbs in the milk, and place raisins in warm milk to soften. Set both of these aside. Heat the butter in a large frying pan over medium heat, and sauté the herbs and onions for 2 to 3 minutes. Season to taste with salt. Add the breadcrumbs and raisins to the herb and onion mixture, along with 2 of the eggs and about 1/2 cup of the Parmigiano-Reggiano. Fill the boiled onions with the mixture, and arrange them in a baking dish lightly oiled or sprayed with cooking spray. In a small bowl, beat the remaining egg with the remaining Parmigiano-Reggiano, adding a little milk. Pour the mixture over the onions. Put a flake of butter on top of each onion. Bake until the surface is golden brown, approximately 20 minutes. Raisins? Excited to try this one. Thanks for the healthy-ish dish!